The start of the game of roulette finds its way back a long time, to be precise in the 17th century when the mathematician Blaise Pascal managed to develop a primitive form of a roulette cylinder. At first instances he had not yet been established to develop a gambling game. The cylinder was actually meant as an eternally rotating wheel. Thanks to his famous rotating wheel and variable odds, roulette (which means ‘small wheel’ in French) has become an iconic casino game. The first variation of casino roulette was introduced in 1796 in Paris, long after Pascal’s failed invention. This first variation was very similar to the variation we still play today with red and black areas numbered from 1 to 36. These early versions of roulette also had two green areas with the 0 and 00. In 1843, two French brothers Francois and Louis Blanc developed the wheel with one 0. They did this to compete with other casinos because the presence of the 0 on the wheel improved the chances of the players. A myth tells that the Blanc brothers would have sold their souls to the devil in exchange for the secrets of the roulette wheel. This is because the numbers on the playing field together count 666. So the history of roulette is more than 200 years old. Later in the 18th century, the cylinder underwent some changes by adding elements from other games. This concerns the English Roly-Poly and the Italian board game Hoca and Biribi. Thanks to the changes, the game of roulette became extremely popular in France and later in more other European countries. A proof of the antiquity of roulette can be found in the French book La Roulette, Ou Le Jour from 1796. In this book the game is originally described with a single 0 and a double 00. At the beginning of the 19th century the game of roulette was fairly settled and the other countries in the world also knew the wheel. From here, European roulette was played with 00 and 0 to 36. The American roulette also had the 00 as an extra, but also had only 1 to 28 to win. The fact that a single zero variant was conceived for European roulette also almost immediately meant a division between the variants. The American roulette had also included the numbers 1 through 36 in the game and thereby retained the 0 together with 00. 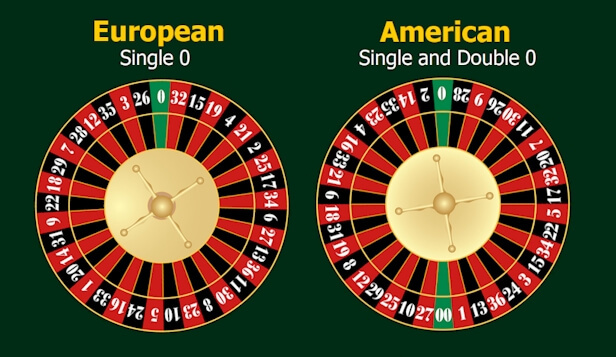 Today both French roulette and general European roulette have a single 0 and therefore only the American variant has a possibility to bet on 00. Thanks to the transition to the online world, roulette is now even more popular than ever. One of the reasons is that roulette is now also available for people who do not have access to a casino and another important reason is that roulette is now available 24 hours a day, 7 days a week.